On February 21 of this year, the American evangelist Billy Graham passed into heaven, after 99 years of life and more than sixty years of Christian ministry. In that time, he reached more than 210 million people (face-to-face and by satellite feeds) in 185 countries and territories on six continents. Those efforts began in 1947 by preaching to 6,000 people in Grand Rapids, Michigan, and grew from there. They included 155,000 people in Moscow, one quarter of whom came to the altar to accept Jesus Christ, a fourteen-day experience at Madison Square Garden in New York, and 1.1 million people at one time in Seoul, Korea in 1973. Given the global impact of Billy Graham’s ministry, we can certainly say he shared the gospel with the world – but if so, it was delivered one person at a time. Like many church ministers, I distrusted most traveling evangelists for their divisive ideology, but Billy Graham was different. He was the only one who asked converts to join an established church, and who connected with area clergy where a mission was going to take place. His Advance Team would meet with local ministers and prepare them to receive a possible sea of new converts who might have zero experience with church culture. He respected Christians across the theological spectrum from conservative to progressive, and because of that he stood out. Billy Graham was inclusive in another way, too. He became friend and personal counselor to U.S. Presidents, politicians, celebrities, athletes, and other leaders. He also changed his mind a few times on hot-potato public issues, after pondering the Bible, considering all sides, and listening to his heart. When I was pastoring he called his evangelistic campaigns “crusades,” but later he called them “missions,” to avoid the offensive connotation of “crusade” among people of the Muslim faith. In the days when televangelists were being exposed for criminal and unethical behavior, he founded an ethics committee to hold all evangelists accountable. 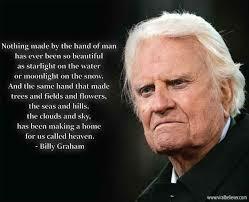 We can thank God for Billy Graham’s life, ministry, and legacy.